Fly-half Charlie Hodgson says it would be a "big call" to play Saracens team-mate Owen Farrell at inside centre for England against Samoa on Saturday. George Ford is expected to replace Farrell at fly-half with the 23-year-old moving across as England look to end a run of five defeats. Hodgson told BBC Radio 5 live: "Owen has played the majority of matches in his professional career at number 10. "To throw him in there would be a big call." 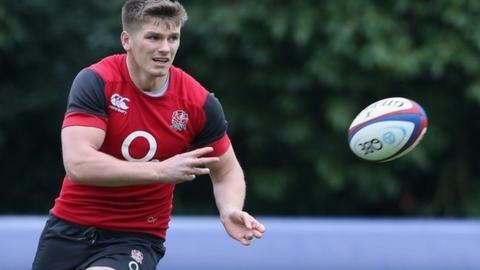 In England coach Stuart Lancaster's first two games in charge, Farrell played at inside centre, with Hodgson at fly-half. And, with Kyle Eastmond doubtful after suffering concussion towards the end of the 31-28 defeat to South Africa, and Billy Twelvetrees hampered by an ankle injury, the prospect of starting Farrell and Ford together is an option. "If they need that extra ball player in the centre, Owen is potentially the player to go to," added Hodgson, who announced his international retirement in 2012. "It's a difficult situation putting Farrell and Ford on at the same time. "Owen is a strong character himself and he wants to have control of what's going on. "He might find that a bit difficult to do that from 12 and it might go against what George is trying to do at 10." England are suffering their worst run of results for eight years, following defeats by New Zealand and South Africa at Twickenham. Just 10 games remain before next year's World Cup, which takes place in England. Following defeat to the Springboks, Lancaster denied his team are in crisis but added that they must recapture momentum quickly. Can England win the 2015 World Cup? Read more on How far away are England from winning the 2015 World Cup?